The building is a single-family home built in 1910 by Alexander M. Stewart, and was later the home of Max Bulshin from 1919-1947. It was then the home of Mendel (Max) Belzberg (brother to Abraham, the founder of Christy’s Arcade) from 1949-1988. Alexander M. Stewart was an Express Messenger with Dominion Express. He lived at the home until 1915, when it became the residence of John W. Russell, the Inspector of Pubic Schools, from 1916-1917. It was vacant for one year before it became the home of Max Bulshin. Max Bulshin (1887-1953) was a local area merchant, and his family resided here from 1919-1947. During that time, he ran a store at 308 8th Ave SE, and later at 351 14th Ave SW, where Max’s wife Jennie worked as a clerk. The Bulshin family moved out in 1947. The following year, Edgar R. Howard was the resident. In 1949, the house became the home of Polish immigrant Mendel (Max) Belzberg and his wife Lena (1906-1968). They had four daughters: Jean (married Richard Barron, youngest son of Jacob Bell Barron); Lillian (Segal), Doni (Stern), and Mimi (Sorokin). Max became involved in the furniture business through the influence of his brother Abraham. Abraham opened the Calgary Brokerage Exchange (later Christy’s Arcade Furniture) and was later the proprietor of the Acme Furniture Company. Max is listed as an employee of Acme Furniture in 1932, and later as its proprietor. Max was also a member of the Polish-Jewish Family Loan Association (established in 1931), which provided interest-free loans to the Calgary Jewish community, particularly families who had escaped Europe during WWII. His wife Lena died in 1968, and Max was remarried to Corinne Gutnik in 1971/72. Max and Corinne continued to live at this house until Max died in 1989. The Belzberg name became very well known through the business ventures of Max’s three nephews: Hyman; Samuel; and William. Hyman took over for his father Abraham in the furniture business as the proprietor of Christy’s Arcade Furniture. Samuel became involved in business and real estate by creating First City Financial Corporation. The building is an early example of middle-class housing in the Beltline. It reflects the Pre-WWI building boom experienced by the city, when southward expansion toward and beyond Lougheed House was experienced. The house is at Lot 12 and the W of Lot 13, in Block 104, Plan A-1, in Section 16. The gable-front style home exhibits an enclosed ground level porch, an off-centre entrance, and a prominent gable facing the street. During the 1980s, the home was divided up in to suites. 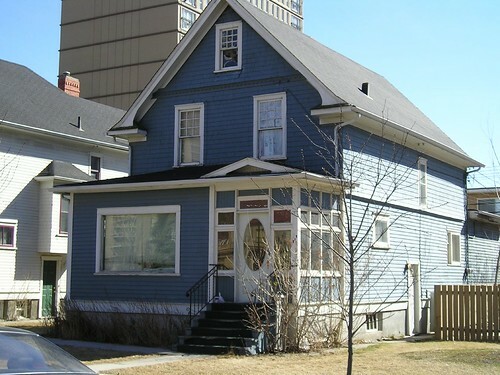 Located next to another fine example of a gable-front style home, the buildings help retain some of the original character of the area around the historic Lougheed House, and provide a comparison of early gable-front style homes. The building was the home of Samuel J.P. Blair and his family for seventy years. He was an Alberta pioneer, and a prominent figure in the Alberta Chapter of the Order of the Eastern Star, a Mason-related fraternity of men and women, for over thirty five years. Samuel J.P. Blair was born in Truro, Nova Scotia in 1864 and married Jennie Martha Fisher (1865-1948) in 1887. In 1890, Mr. Blair arrived in Medicine Hat, and in 1892 he came to Calgary with his wife and son, Gordon (1889-1966). On first arriving in Calgary, Samuel worked as a real estate dealer. In 1900, the Blair’s daughter Helene was born. Samuel Blair bought the East half of lot 13 and all of lot 14, on Block 104, Plan A1 from J.L. Johnston in 1910. In 1911, the home was built and the Blair family lived there beginning in 1912. It was also around this time that Samuel became an important force in the development of the Grand Chapter of the Order of the Eastern Star in Alberta. The Order of the Eastern Star is a Masonically-related fraternity of women and men. The Order is not, however, part of the Mason fraternity but membership is based on Masonic affiliation or relationship. The order is now the largest Fraternal organization in the world to which both men and women belong. In 1911-1912, Mr. Blair held the position of Worthy Grand Patron for the Mountain View Chapter in Olds, the oldest Order of the Eastern Star Chapter in Canada. It was also the Mountain View Chapter that took the initial steps towards the formation of a Grand Chapter for the Province of Alberta. In 1913-1914 Blair was elected to the position of Grand Secretary for the Grand Chapter of Alberta Order of the Eastern Star. He would hold this position every year until his death in 1948, making him the longest position- holding member in the history of the Alberta Chapter. His wife Jennie was also involved with the Order, holding the positions of Associate Grand Conductress, Grand Conductress, and Worthy Grand Matron. The Blairs also remained very involved as Part Worthy Grand Matron and Part Worthy Grand Patron within the Order. There are also records of the Blairs holding events for the Order, such as a tea, in their home at 715 14th Ave.
Samuel Blair was also a member of the Alberta Accepted Free & Ancient Masons and the Shriners of the Al Azhar Temple. During the 1920s Samuel worked as traffic manager for Wood, Vallance & Adams and as the treasurer of the Calgary Conservation Association. He retired in 1930. Following Samuel and Jennie’s deaths, the home came under the ownership of their son Gordon C. Blair. He lived there with his wife Elizabeth and worked as an accountant until his death in 1966. After Gordon died, Elizabeth remained in the home until her death in 1982. The building is a good example of a wood-frame gable home built during the Pre-WWI period, and is a lasting example of middle-class residency in the area. It shows the growth experienced by the area surrounding the Lougheed House during the beginning of the 20th Century. The house front faces the Lougheed house and surrounding gardens. The building remains as an example of the middle-class single-family housing. The gable-front style exhibits an off-centre entry (typical of gable-front style homes), ground-level porch, and a prominent gable facing the street. This street-facing gable and covered porch create the prominent details of the façade. It also incorporates a small cross-gable on one side to create a shallow wing. The porch exhibits decorative brackets and spindle-work. The interior of the house has been renovated. During the 1980s the home was divided up into suites. The building helps to retain some of the original character of the area around the historic Lougheed House. 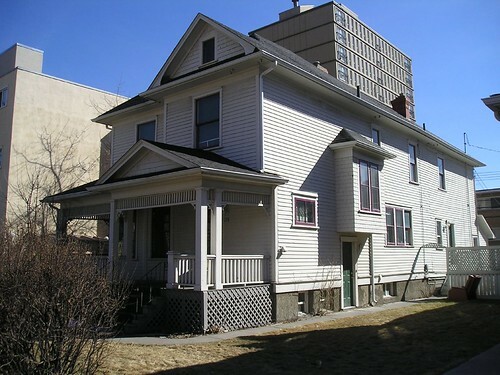 Located next to another fine example of a gable-front style home, the two structures help to retain some of the original character of the area that surrounds the historic Lougheed House site and provide a comparison of gable-front style homes. The house also provides an example of the trend in the Beltline area to convert single-family dwellings in to multi-suite apartment-style homes. ** Thank you to the Beltline Communities of Victoria and Connaught and Alexa Collopy for contributing to this research.